With all the badges, and Articuno already captured, I decided to find fly before I eventually set my eyes on finding Zapdos and Moltres. Fly took a bit of time, being slightly hidden and all, but at least it wasn't too far away from where I anticipated. Anyways, I already knew where Zapdos would be, so I flew to the poke center above the power plant before I surfed to it, then made my way in. One of the things that I love love love about the game is the music as well. Whenever you enter a hideout or some abandoned location, you have this heart pumping music, almost as if something is trying to escape, but is being held back. I made my way through what I thought was a nice maze full of interesting pokeballs, I mean Voltorbs and Electrodes before I finally laid eyes on him! The legendary bird, Zapdos! Having already caught Articuno, I knew the secret to catching him so I decided to go with Raichu and Thunder for the lower damage chance then I managed a quick attack before switching in Venasaur to get him to sleep with sleep powder. With him asleep, and his low hp, it didn't take many ultras to catch him. Now of course, before heading to Indigo Plateau, I decided to try the mew glitch, flying from a trainer that I purposely left to Lavendar, but the glitch didn't work, and I couldn't even open the menu either so I had to reset. I'm pretty sure I forgot something very important, maybe getting an Abra or something (gotta look it up again) so look forward to this in a future blog! I continued until I got to the beginning of Victory Road, then showed all my badges, surfed and walked all the way till I hit the usual cave system. Although, I completely forgot this existed haha. Thinking I was going to go into the fight, I used up all my money to get Calcium to boost specials, and used my stash of iron, carbos etc.. that I've saved throughout the game. The game wouldn't let me use more than 3-4 for each of my 3 pokemon, so I ended up having to re-sell a lone calcium. I wanted to really raise my special on my Raichu quite a bit due to Lance's fight, too bad. I spent at least 130,000 for all this! He was a bit tougher to catch, mostly since his fire attacks would slice my Venasaur's hp quite a bit, and he was really resistant to sleep powder. Eventually, I got him to go to sleep, and with his low hp, caught him like the rest. With victory road cleared, the indigo plateau awaited my arrival. I wanted to go all in, and as mentioned before, my plan was to use only my main 3 pokemon though I kept the other 3 legendaries with me just for the fun of it. It also helped knowing that worse case scenario, I can sacrifice the three of them to revive/heal my other 3. As you guys can see, there hasn't been any major changes since my first blog. I just decided sleep powder was a better option than tackle for Venasaur (already had cut). For Pidgeot, I taught Fly instead of razor wind, and then taught Mirror Move instead of Gust which frankly was a terrible move to keep haha. As for Raichu, I originally taught Skull Bash over Seismic Toss, but found out it was a 2 step move, so I taught Thunderbolt since Thunder has such low pp (10!) and I'm going to need all the electric moves I can get. With all items used and bought, it was finally time to become the pokemon champion, to be the best like no one ever was! First up was Lorelei! I had no idea what kind of pokemon I'd be facing, actually thought it'd be a water type haha so I left my Venasaur in the first spot. The battle itself wasn't anything crazy. My Venasaur razor leafed the first three pokemon with relative ease. Being able to hit crits helps a lot here seeing as ice moves are the bane of Venasaur. Jynx managed to hit with an ice beam which landed a crit from the first time knocking my Venasaur unconscious. Raichu took care of the rest with thunderbolt then facing Lapras, a thunderbolt into quick attack was all I needed. I did lose quite a bit of hp from what I believe was hyper beam, but overall, the battle was under control. Second up was Bruno! Looking at the environment, I figured he may send a Machoke up first so left Pidgeot, but he put out an Onix so I had to do a change. 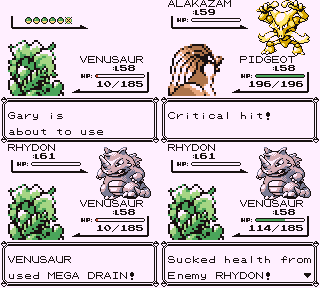 First pokemon easily died to razor leaf. From there, I switched my Pidgeot in for Fly and/or Quick Attack since some of his pokemon were weak to fly moves, and to also save Raichu's pp. Then back to Venasaur for razor leaf then back to Pidgeot to finish things off. By this point, I was starting to feel confident. The first two leaders were a piece of cake, but I had the shivers when I walked into the next room, and realized that I'm going to go up against a ghost user. Honestly, over half of my moves are normal moves, and the ones that aren't have a decent miss chance, or may not do as much damage as hoped. The other problem was Thunder. I was hoping that it wouldn't miss as much, but I found out in the next fight that Thunder's miss rate just went up through the roof somehow! Third up was Agatha! You guys may or may not recall, but one of my worst trainer fights was against a nobody at Sabrina's gym. That trainer mostly had a haunter, and 2 gastlies. What made the fight rough was the combo of Sleep+Confuse Ray. Of course, I came prepared, but can you really be prepared against this opponent? Her first pokemon was Gengar, which was a bit terrifying. I ended up starting with Raichu and managed to hit 2 Thunders back to back if I recall correctly so I managed to survive the first pokemon! Golbat was easy, and a Haunter was changed into Arbok which was easy enough to kill. Problem was that Thunder was starting to fail big time. I believe in this match, it failed a total of 3 straight attempts, back to back, at least! I had to switch to Thunderbolt, before it started working again. Haunter was the most troublesome, with Confuse Ray into Hypnosis 3x in a row as I kept using awakenings. I took some risks with confusion in place, but I survived then thundered, and maybe thunderbolted too (or maybe just Thunder 2x, don't remember) her Gengar which kept trying to use Dream Eater. Phew, one more obstacle remained in my way. From my crystal days, I remember Lance or whoever was the dragon user in that game using multiple Dragonites, so I went in prepared to try and keep healing, and hoping for crits as needed. It was finally time to met the dragon pokemon master, Lance! Finally, I was done. Having beaten the elite four, I can finally rest! It's all over, right? Right? 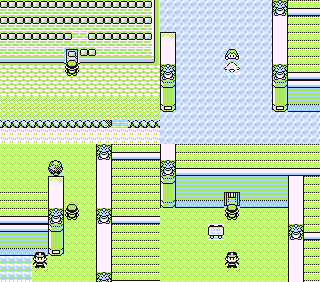 He was waiting, my rival or the guy who was always my punishing bag had beaten the elite four just before my arrival. It was going to be the last trainer battle with my rival who now has a total of 6 pokemon, including a level 59 Alakazam, level 61 Rhydon and, a level 65 Charizard. Cue the final battle music! Once I got close, the game automatically started things off, so it was finally time! Up first for my rival was his Pidgeot while my Venasaur was my first pokemon. Alas, I came out with 10 hp in a really close fight where Pidgeot used Sky Attack while I aimed for crits using Razor Leaf! With his Alakazam on the way, I decided to change to Pidgeot figuring a fly into quick attack would be my best bet to take him out before he Psybeams me into oblivion. He ended up trying two reflects, before my Fly ended up landing a crit for a one-hit KO! His next pokemon, Rhydon was also a snap. I ended up using Mega Drain to heal my Venasaur from 10 hp to 114 haha. That move is awesome when it works well! Pidgeot took care of his Exeggutor which died to 2 flies while it managed a single stomp if I recall properly. His Gyarados managed a hyper beam, but a single Thunderbolt from Raichu sent it packing, leaving my rival with a single pokemon, his Charizard. With my Raichu already at low hp, I decided to forgo Thunder, and went for Thunderbolt instead. This proved to be the best idea as Thunderbolt had a lower miss chance, and was super effective, helping me land another one-hit KO! With that, my journey was finally over. Prof Oak decided to come over to congratulate me, and scolded my rival for not treating his pokemon right haha. All is right in the world! Hope you guys enjoyed the read. If you like my content, don't forget to rate it. I'll be having one more writeup dealing with catching mew, if I still can, and mewtwo so stay tuned for a bit more pokemon red! 2 electric 4 flying and no water/ground/psychic. BOLD MOVE. Grats on the victory - good luck in the Cerulean Cave catching Mewtwo! Thanks. Agatha, and Lance would've been had some things not landed in my favour. No, he can still be caught, but I also beat the trainer who would've helped me get one so I'd have to try and find a slowpoke in order to catch one. Gonna be difficult, but worth a try. thanks! Well, I'm sure I can easily catch him but it's going to be fun exploring that cave, knowing that I've already beaten the game and all. How did you find the AI? When I got hooked to Pokémon GO 2 years ago I replayed all gens, and I remember thinking the AI sucked so badly in the Gen 1 game. Was a bit anticlimactic at times. Tbh, aside from several instances, the AI felt ok to me. For example, I had Gengar try to use dream eater twice when I wasn't asleep, but maybe that was partially due to the fact that Haunter put my pokemon to sleep 3 times in a row in the previous battle before it tried another move. For the elite four, I've been beaten with dragon rage, hyper beam, ice beam, psybeam, wing attack, rock slide etc.. so the moves aren't lacking, and the AI isn't always doing something silly, but yes, the AI isn't perfect by any stretch of the imagination and can always use the work. I'm not sure if that answered your question, so if not, feel free to expand as you like. Wow, congratulations on sweeping through the Elite Four so smoothly! Nah that's exactly what I meant. I remember Agatha in particular being a complete dummy. As you said, Dream Eater when my mon is not asleep, Hypnosis when it is... Sabrina was also a joke. ^ I don't personally know how the AI in the games works, but while the Dream Eater thing was bizzare, I attributed it to the AI thinking my pokemon was sleeping asleep despite Haunter getting knocked out. But yes, if Gengar used hypnosis then Dream Eater, it would've been rougher. Still, I had awakenings saved, and was ready with revives, potions etc... so I would've survived though with less items probably. As for Sabrina, keep in mind that the only pokemon I really faced was her Alakazam who kept Psybeaming me so tbh, I think Sabrina was rough as is. Just so happened that I had the right moves, and potions to keep my pokemons fighting. If you read the previous blog, it'll give more details, but my pokemon was poisoned from Venomoth then had to keep getting Psybeamed for several turns. Thankfully, swift and quick attack are both pretty good moves overall. Thanks! I wouldn't call it so smoothly haha, mostly since I did have a scare or two, but it wasn't as bad as I thought it would end up being. Having those 3 legendary birds on the team, even if I wasn't using them, probably gave me some confidence boost since if worst comes to worst, I can revive my 3 mains while I get them knocked out in quick succession. However, I was hoping to completely avoid going that route because that would mean that the challenge would be void too, and thankfully I did. I do wonder if I should've just not had them there in the first place, but too late now. I did play the yellow version (only the first 150 pokemons) few weeks ago. I had lvl45 - lvl55 (Chansey, zapdos, articuno, slowbro, snorlax and blastoise) pokemons ready for top4. I won without using any items (kp-plus, superdrink etc). I never used such items all the time. When I got mewtwo, fighting against top4 became way too easy with it. edit: When I made 10+ pokemons lvl60+, I stopped to play this game. Well, you have quite the powerhouse team over there. Chansey has insane hp then you got two legendaries, a psychic/water type which is amazing (the psychic type) in gen 1 games, snorlax which can learn an insane amount of moves+amnesia+rest+insane hp and finally, a fantastic starter pokemon imo (Bulbasaur turned out to be surprisingly good haha). Slowbro killed 2 opponents alone. Articuno the other 2 alone. Zapdos killed first opponent alone. Snorlax never got a fight and I used chansey only to heal my pokemons. Gary has many pokemons that are weak to Ice -> Articuno did 2/3 of the battle. 4/5 pokemons of each opponent is weak to one element. Lorelei -> I pretty much use Venasaur, despite having a type disadvantage due to ice moves, for the purpose of using razor leaf. 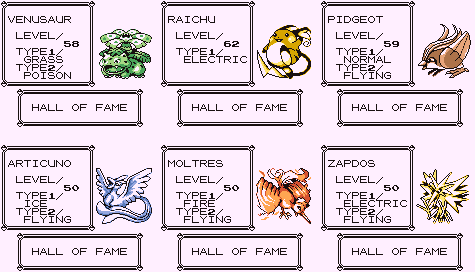 Had I one-Ko'd Jynx too, or it missed its ice move, I would've killed off Lapras as well with a single pokemon. Bruno -> I heavily relied on Pidgeot for Fly, which is a hard counter to machoke, machamp, hitmonlee, and hitmonchan. Venasaur was only there to kill Onix. I could've use Pidgeot, but I didn't want to needlessly prolong the fight. Agatha -> was the rougher one seeing as I didn't remember what's the biggest weakness of ghost pokemon is at the time, especially seeing as I decided on no psychic in my party. Anyways, I already boosted my Raichu's special with calcium, enough that 1 Thunder crit, or 2 thunderbolts should ideally take down Gengar. Not to mention Golbat is weak to electric, and Arbok takes lots of damage from Thunder. Raichu ended up beating her whole lineup on its own here. Lance -> Much like Agatha, I didn't go heavy on the counters here. I just used what I had at hand. Gary -> was easy enough with my Raichu/Venasaur hard-countering most of his pokemon again. Who's Siegfried? lol. I think what you're failing to realize is that the whole purpose of playing the game was to win with only 3 pokemon that I liked, aka 1 starter+2 captured. Sure, I could've used Zapdos or Articuno to make life easier, seeing as I did capture them, but I wanted to use ones that I leveled myself. It makes it more fun that way, even if a little more difficult due to counters and such. I didn't know he is using more names. Siegfried in Germany and Peter in France. ah I see, didn't realize they changed names haha. Ya, I do recognize Siegfried as German now that you guys mention it.